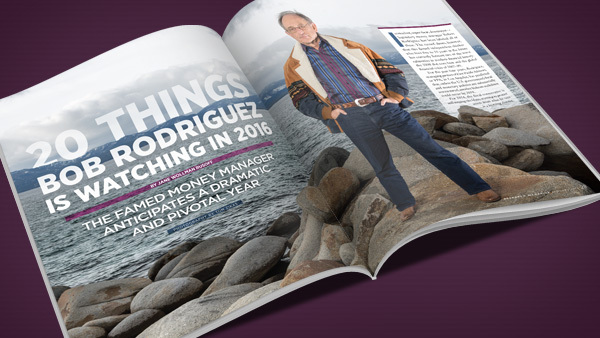 The famed money manager anticipates a dramatic and pivotal year. Iconoclast, super-bear, doomsayer — legendary money manager Robert Rodriguez has been labeled all of these. The record shows, however, that this famed independent thinker who lives five to 10 years in the future has correctly forecast two of the worst calamities in modern financial history: the 2000 dot-com bust and the global financial crisis of 2007–09. For the past four years, Rodriguez, managing partner of First Pacific Advisors, or FPA, in Los Angeles, has predicted that, unless the U.S. government’s fiscal and monetary policies are substantially restructured, another hideous meltdown could occur by 2018. For 2016, the fiscal conservative is still singing the blues, warning to protect assets from what he says is a looming disaster. In anticipating the global financial crisis, contrarian Rodriguez, 67, moved to a cash level nearly 12 times that of the industry. For his prescience and prudence, he endured sharp shareholder criticism and heavy fund redemptions. For nearly two decades now, Rodriguez has maintained that the presidential election of 2016 and the following eight years will determine the direction that the U.S. takes — leading to either prosperity or decline. Rodriguez joined FPA in 1983, serving as CEO for 31 years. For the past four, he has taken a supporting and advisory role following a one-year sabbatical — part of his long-time succession plan — after which he turned over day-to-day management of key funds to his partners. Value-oriented FPA manages about $34 billion for institutional and mutual fund investors. Compound growth rate of the FPA Capital Fund from Aug. 1, 1984, through Oct. 30, 2015, was 13.50%. The FPA New Income Fund, with a compound rate of 7.32% since inception, has never had a down year in 31 years. From Rodriguez’s vantage point, nothing much has changed on Wall Street since the crisis: many of the questionable practices that were employed by banks and investment firms and the theory of “too big to fail” are still operating. In a wide-ranging phone interview with Research in mid-November 2015, Rodriguez, from his Lake Tahoe, Nevada, base, forecast the markets, the economy, financial regulation and more for the coming year. 1) Regulation: It’s out of control, and more is coming. It’s insane: we’re giving more power to the Federal Reserve, which helped create the last financial crisis. The SEC couldn’t even find Bernie Madoff for 10 years when they were told about him! Increased, enhanced regulation will work to destabilize markets, not stabilize them. 2) Market Volatility: I fully expect the markets to be down, but they’ll have higher volatility because of the election-year frenzy. We’re going to go into a period of extended hyper-market volatility, and one of the things that will contribute to it is the absurd, unsound, insane Dodd-Frank law. 3) The Fund Industry: It will continue to expand, but the mix will be changing. The active manager industry is under duress from index funds and ETFs. Active managers are finding it progressively more difficult to outperform the financial markets. 4) Earnings: They’re coming down. Nominal GDP is affecting earnings-per-share growth going forward. EPS growth has risen because of the bottom-line engineering of stock buybacks. But now there are fewer levers to pull. So EPS growth in the S&P will be more a function of top-line revenue growth. We won’t achieve [others’ forecasts of] a $120 earnings number unless corporations can borrow a ton more money to buy back a ton more shares so they can manipulate bottom EPS upwards. 5) Stock Market: I hate the stock market; I just find it unappealing. The industrial sector is in or is about to enter recession. The mining sector is being crushed. Earnings challenges will grow next year across several sectors. Stocks will not be good performers. So I don’t see a lot of opportunities. Based on my thinking that energy prices would be vastly different from the past 30 years, I [had reduced energy holdings and] sold my last energy stock in my personal portfolio in July 2014. I’m watching Shanghai steel rebar [construction reinforcements] prices, which recently hit a low of about 1,980 yuan. That’s indicating the industrial weakness in China. Thus, we have industrial manufacturing headwinds worldwide. 6) Bonds: Our bond portfolio is of exceedingly high quality and short duration. But bonds are a push, and I don’t see a lot there. I’m waiting patiently. Why should I get excited about a market that, in terms of interest rates, is near 300-year lows! The ability to transact in the corporate bond market has collapsed. The reality will be far greater volatility in bonds than what people are envisioning today. From a longer term standpoint, I think bonds are effectively a loser’s game. 7) Asset Allocation: I’m bullish on cash, and I’m taking appropriate action personally to, hopefully, protect myself; and, hopefully, we’re protecting our firm from the insanity and absurdity of the [government's] policies that are being deployed and from expected high volatility. We have high percentages of cash in many areas of the investment portfolios. 8) Commodities: I’m watching one of my favorite commodities: copper, which is in the process of getting hit again today. It was breaking [last year] and was a leading indicator throughout the weakening industrial downturn. Should it break $2 a pound, which I think is imminently possible, it would be indicative of something significantly weaker. 9) Presidential Election: This is probably the most important election in 100 years. The next eight are critical as to how this country will go forward. If we don’t restructure the fiscal side of the balance sheet, we could face a financial crisis equal to or greater than the Great Recession. [George W.] Bush and [Barack] Obama have been the two most destructive forces for long-term stability of this country with their expansive, uncontrolled debt and entitlements. This election will be about entitlements. If the American people decide to continue on with the goodies as presently constructed, a painful day of reckoning will occur in the not-too-distant future. If we turn away from some of these policies and make some hard decisions, which could be painful in the short run but beneficial in the long run, I could get hopeful. 10) U.S. Productivity: One of the most important numbers to look at is productivity. It’s been averaging 1% from 2009. That’s the worst productivity cycle and capital spending cycle since 1950. Unless you have productivity improvement, you don’t build an economy that sustains itself. We’ve had inept and foolish policies, like “Cash for Clunkers.” I’m not expecting the situation to improve anytime soon. 11) Debt: The society and the government cannot live beyond its means: You can’t continue to borrow forever. We need a fundamental change of direction in this country. I want to be hopeful that we don’t get into a Japan-style situation where you experience declining population growth, a deferral of marriages and a lowering of the fertility rate because that means you can’t have enough people in the workforce to support the debt and liabilities that have been created. 12) GDP: I continue to expect languid, substandard economic growth, probably no more than 5%, possibly even lower, assuming that nominal GDP growth is in the 3% range. That would imply real GDP growth of, maybe, 2% with the inflator of approximately 1%. As a result of the policies of quantitative easing and zero-based interest rates, market valuation is now at the highest level of GDP ever: 206%; that’s up from the high of 183% in 2007. This does not demonstrate a high success-probability outcome. 13) Inflation: It will remain subdued, but the outlook longer term could be materially higher depending on what happens with the election and monetary policies. I believe we’re on the local train to Inflation Central, making stops at Disinflationville and Deflationville. 14) Interest Rates: Zero-interest rates will be destabilizing longer term. I don’t see a significant interest-rate cycle in 2016 going into 2017. If they raise rates [in December 2015], they’ll be forced to revise their outlook downward in 2016 because they’ll be facing issues from competitive devaluations in the euro, Japan and weakening international economic growth. 15) Worldwide GDP Growth: It will be slowing, and that will create pressures on oil. Slowing demand versus supply cutbacks will affect how energy prices behave. You’ll see several periods where West Texas Intermediate crude trades in the $30s. 16) U.S. Dollar: We’re in a currency war. I watch the U.S. Dollar Index (USDX) and the Dollar Index Spot (DXY). The dollar will continue to gain strength over the next year or two, and it could get quite dicey in the currency arena. We’re in a period of competitive currency debasement on the parts of Europe, Japan and China. This has implications for U.S. economic growth and worldwide growth. 17) Job Market: I’m watching wage and unit labor costs. In 2016, there will be pressure to raise labor costs driven by some [parts] of the economy and artificial drivers such as the minimum wage, which is absolutely devastating to the job aspirations of 16-to-20-year-olds. People who push these things should be ashamed of themselves. A lot of the employment expansion [so far] has been in lower paying, lower quality jobs; and I expect more of the same [this] year. 18) Consumer Spending: I don’t see much happening here, [though] consumers are starting to borrow again. The key driver in consumer spending [last] year was health expenditures and medical insurance — thanks to the health care laws, more of which are coming down the road… This is a transformative period in terms of goods and services: no longer is a person in competition with the person next door — they’re in competition with the world. The Internet has destabilized many areas of retailing. 19) Public Opinion About Wall Street: It’s going to get worse — the demagogues are out in force. I fully expect Wall Street to be held up and pilloried, as usual. That will provide more fodder to increase regulatory oversight. 20) War and Peace: To be involved overseas in a large way is not likely under the current administration. I don’t see [our] getting [substantially] more actively involved — that is, having significant troops on the ground in the conflict zone. The administration may be dragged back yelling and screaming on certain things, but I don’t see a material move [this] year unless something really big is radically out of alignment.